Monday evening I tweeted how having a husband meant never (rarely) having to shovel. Because he came with a snowblower — and he enjoys using it. Before I was hitched, I lived on my own in a house over in Guilderland. The road was a dead end and, as a result, not as wide as your average street. When the town plow came down, they’d push 80 percent of the slop to the right side (naturally) leaving those of us on the east side of the street with a heap of crunchy, crusty, icy, hardened snirt to dig out. No matter how many different types of shovels I bought, none were enough to tackle what felt like a pile of concrete at the end of my driveway. Even my neighbors who had snowblowers struggled. Then I got married to a man who had a snowblower and two — yes, two – tractors. Snow removal, it seemed, was going the way of dead mouse retrieval. I’ve now been wed for nearly four years, and I’m appreciative each time it storms I can be inside cooking, vacuuming, reading or playing around online while R clears the walkways and the driveway. 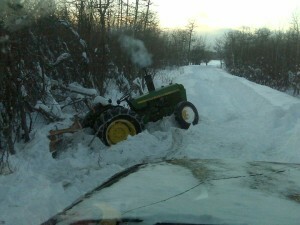 Not our actual tractor (it was too dark to take a photo), but the predicament was similar. As I lie in my heated bed Monday power reading Jane Green’s “Tempting Fate” on my Kindle (I was 90% done and had to finish before I could sleep), R trudged in, bundled in his cold weather gear, snow stuck in his 5-o’clock shadow, his nose dripping from the frigid temperatures asking me to put on my boots and coat and come outside. I (reluctantly) peeled off the covers, put on sweats, knee socks, my boots, a hat, my warmest (Carhartt, if we’re being honest) coat, a scarf and mismatched mittens and went out to help drag the John Deere to safety. Once the tractor was recovered, I came inside and was tempted to amend my tweet. Being married may mean never having to shovel, but it does mean getting out of your warm and cozy bed at 10:30 p.m. to rescue the one who saves you from having to clear the snow. This entry was posted in Home life on February 5, 2015 by Kristi. Since I have been a stay-at-home mom for the last 11 years, it’s mostly my job to try to clear the snow. We have a guy who plows for us because we have a huge driveway, but there is still a lot of other places he can’t get to. We also are responsible for my husband’s elderly mother who lives next door. Monday was a rare day when my husband’s office closed so it was very nice to have help.